NCCPR Child Welfare Blog: Captain America vs. the algorithm! SPOILER ALERT: Some key plot elements in Captain America: The Winter Soldier are discussed below. I’m a little behind on movies. 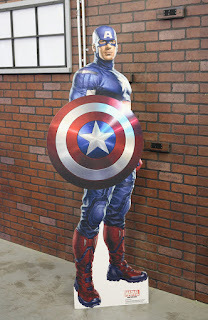 It was only last week that I saw the 2014 film Captain America: The Winter Solider. Imagine how surprised I was to find that the ultimate weapon of mass destruction in the arsenal of the supervillains turned out to be – predictive analytics! Seriously. The villains, who prize order over everything, decide the best way to create a New World Order is to get rid of anyone who might interfere with their plans - before it even occurs to them to try. So they plan to use an algorithm to predict who will become a terrorist or, perhaps, just a dissenter, it’s never quite clear – and terminate them. They even try to seduce Captain America’s allies by painting a picture of themselves as the good guys; after all, they just want a world where terrorists could be stopped before they even contemplated becoming terrorists. Of course this is only the stuff of comic book sci-fi. In real life no one would ever seriously propose a drastic, coercive, punitive intervention into someone’s life based on an algorithm’s prediction that they might do something bad in the future – unless, of course they work in child welfare. Think I’m kidding: Check it out. Of course, by the end of the movie Captain America has saved the day – for now. But there’s always a sequel. Perhaps in the next sequel those who hatched this scheme will have gone into hiding where they are more appreciated – in child protective services agencies.